In the centre of Papua New Guinea is the Southern Highlands Province, called "The Papuan Wonderland" by explorers who discovered these hidden mountain valleys in 1935. The Southern Highlands is a land of lush, high valleys wedged between impressive limestone peaks. The headwaters of the Kikori, Erave and Strickland rivers cross the province, beneath towering Mr Giluwe, the second highest mountain in Papua New Guinea. International caving expeditions have discovered caves of enormous depth and length and anticipate further significant finds in areas yet to be explored. This cool alpine setting is the home of the Huli and Duna Wigmen. Famous for their elaborate and colourful dress, these proud warriors have great reverence for birds, imitating them in ceremonial dances and decorating their wigs with feathers, flowers and cuscus fur. The wigs, are woven from human hair, donated by wives and children. Everlasting daisies are especially cultivated for use in the wigs, while their faces are painted with yellow and ochre. The women, by contrast wear black for their wedding and coat themselves with blue-grey clay when mourning. Clans in the Southern Highlands have a strong and intricate social system little affected by change. It is one of the few places where the traditional way of life can be seen in everyday living. Ceremonial rituals are strongly observed. Men and women can still be seen wearing traditional dress, tending their gardens and pigs and building their bush material huts. Visitors to the tribal wonderland of the Southern Highlands can stay in a variety of accommodation from basic guest houses to luxurious mountain lodges. Accommodation at the Ambua Lodge in the Tari Basin is in luxury bush material huts, set on a hillside of flowering gardens with panoramic views of the surrounding mountains and rainforest. The crisp mountain air is perfect for taking advantage of the many guided tours organised by The Lodge. Walk along rainforest tracks to go bird watching, take a trip down the river to see the waterfalls or go by four wheel drive to visit a village and watch a traditional singsing. 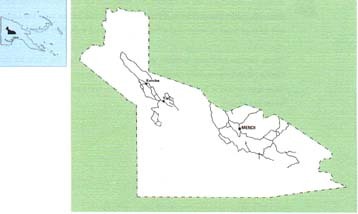 South of Mendi, the capital of the Province, is Lake Kutubu. The beauty of this tranquil setting can be enjoyed from the Lake Kutubu, situated on a ridge overlooking the lake. The Lodge, built by the local people to allow visitors to observe traditional life in comfortable surroundings is constructed of bush materials. Butterflies and Birds of Paradise are common in this area. The Lodge will arrange tours to some of the beautiful rivers and waterfalls nearby. Warm clothes and wet weather gear are recommended for visits to the Highlands and, particularly for women, conservative dress would be considered more appropriate, ie. long skirts rather than shorts and a sarong over a swimsuit when swimming. Western Province, on the southern coast, bordering Irian Jaya, is a perfect destination for fishermen, photographers and lovers of flora and fauna. The countryside here is unlike anywhere else in Papua New Guinea. Wide open grasslands are home to Rusa deer, wallabies and wild pigs. Crocodiles, and lizards linger near river banks and teems of wild fowl and ducks fly across rivers. Two of the greatest rivers in the country, the Fly and the Strickland, run for almost their entire length through Western Province. The premier tourist destination in Western Province is Bensbach Wildlife Lodge, located on the Bensbach River. 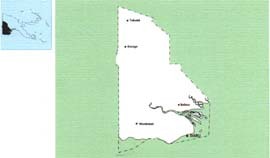 The mouth of the river forms the border between Papua New Guinea and Irian Jaya. The area is a vast open, seasonally flooded plain, lightly populated with people, but crowded with bird and animal life. The Bensbach Lodge, small, comfortable and built of local materials, has established a reputation for spectacular barramundi fishing. Other species include ox eye herring and saratoga. Fresh locally caught fish and game are part of the regular menu. Lake Murray, in the centre of the province, is the biggest like in Papua New Guinea. There is crocodile research station at the lake. During the wet season the lake spreads to five times its 400 kilometre area. Daru, the main town of the Province is situated on a small island of the same name just off the coast. Once a busy pearl and beche-de-mer trading port, it is now the centre of a growing fishing industry. Crocodile skins from the province are packed and exported from Daru. Air Niugini offers direct flights from Port Moresby to Daru while third level airlines service most parts of Western Province. The Resort is located on a privately owned oil palm plantation on the shores of Kimbe Bay. The Bay is fringed by volcanic mountains, some still active. Divers can explore volcanic caves draped in staghorn coral and reef drop-offs. The clear blue waters are home to dogtooth tuna, trevally, barracuda, dolphins and dugong and for night diving, the luminescene lights the way. The most popular site for night diving is known as "The Cathedral", a horse shoe shaped reef with a large cave at one end. The floor is covered in white sand and the outside is draped in staghorn and gorgonia coral. Walindi has resident instructors to provide tuition for first time divers. The fishing and snorkelling are excellent. From the lowland rainforest, to alpine grasslands, to the shrouded misty peaks, Western Highlands Province is a land of colour and vibrancy. The capital city, Mt Hagen, is a bustling commercial centre where wealth from coffee and tea plantations has brought rapid change to traditional life style. Old and new ways live curiously together, not always harmoniously. 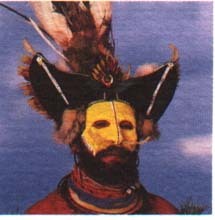 Mt Hagen has a reputation as the "wild frontier" of the Highlands. The Saturday market in Mt Hagen is a focal point of local life and provides a meeting place for traders from all over the province. It is a kaleidoscope of fruit and vegetables, birds, animals, people in bright shirts and skirts, some wearing flowers or grass in their hair. The men traditionally wear a long beard and the women wear an array of brilliant scarves and carry their brightly coloured string bags. 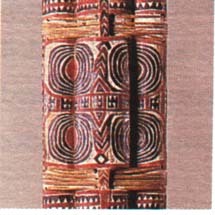 These bags, called bilums, are used to carry everthing from babies to firewood and are made by treading an entire length of string through each loop. Traditionally the string is made from tree bark, although these days many women buy synthetic yarn from the local stores for their bilums. The Mt Hagen market is an opportune place to purchase tradionally made bilums. Handicrafts can also be found at the Western Highlands Cultural Centre in Mt Hagen. It features a reconstructed village hut and has a museum with exhibits of artefacts and curios. Singsings are held regularly throughout the province. These are gatherings of clans in traditional costume where ritualistic dancing and singing is perfomed for ceremonial reasons. However there are many opportunities throughout the year to watch a ceremonial singsing. 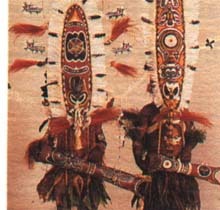 The most popular time to visit Mt Hagen is August when the annual show is held. 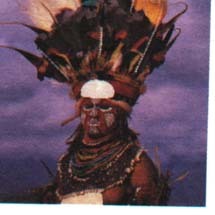 Hundreds of different Highland tribes are represented, each wearing their distinctive tribal head dresses of feathers and flowers and body paint. It is a wonderful opportunity to se a glimpse of the richness of traditional Highlands social structure. Away from Mt Hagen, Western Highlands Province offers spectacular walking and trekking adventures. The Wahgi Valley is a magnificent natural tract of lush greens, roaring rivers, virgin rainforest and ordered gardens. Ther are several walks available depending on time and energy. For the serious trekker, the 4509 metre summit of Mt Wilhelm can also be reached from Mt Hagen. Accommodations in Mt Hagen ranges from bush material lodges to international standard hotels. Air Niugini has flights from Port Moresby to Mt. Hagen daily and direct flights are available from Cairns, Australia to Mt Hagen. 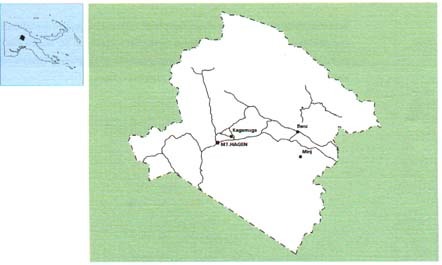 Third level airlines also provide services from other regional centres.